BRAVO is Europe`s biggest youth magazine. Each year the readers can vote their favourite artists. There are no nominations only the readers of the magazine choose by sending a postcard. The winner gets a gold OTTO, the second a silver OTTO and the third a bronce OTTO. The award is a little indian statuette called OTTO. Mariah Carey is with 4,51% at No. 5 of the BRAVO readers favourite singers. With 14.79% Mariah is voted for the second best looking female singer of 1999. The album #1's is at 7 on the favourite album list. A good position because the voting forms were out just a week after the album was out. Mariah Carey gets her 4th OTTO Award. This time it`s like in 1995 the SILVER OTTO for the second favourite female singer of the year! Mariah got 13.41% of all votes. Butterfly just missed the favourite CD of the year by 0,69% (No. 2, 15.73%). She gets the BRONZE OTTO for the third favourite female singer of the year. 10.44% voted her. She also won for third favourite album of the year for Daydream with 8.45%. She won the SILVER OTTO for the second favourite female singer of the year! 22.17% voted her. She also won favourite album of the year for Daydream with 31.67%. She won the the GOLD OTTO for favourite female singer of the year! 67.32% voted for her! She also won favourite album of the year for Music Box with 65.81%. Her most successful year in Germany. The single Without You was also the best-selling single of 1994. No.5 with 5.18% of all voters. 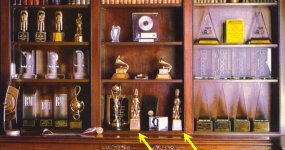 The CD Music Box placed at No. 3 with 9.33% of all votes. This photo was in the Instyle magazine in May 1998. I was very happy to see that Mariah likes the little Indians from Germany.